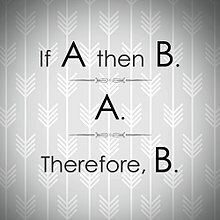 This logical argument utilizing modus ponens makes use of three statements in logical form expressed in simplified English. This article is about the term as used in logic. For the linguistics term, see Logical form (linguistics). "Argument structure" redirects here. For the possible complements of a verb in linguistics, see verb argument. In philosophy and mathematics, a logical form of a syntactic expression is a precisely-specified semantic version of that expression in a formal system. Informally, the logical form attempts to formalize a possibly ambiguous statement into a statement with a precise, unambiguous logical interpretation with respect to a formal system. In an ideal formal language, the meaning of a logical form can be determined unambiguously from syntax alone. Logical forms are semantic, not syntactic constructs; therefore, there may be more than one string that represents the same logical form in a given language. The logical form of an argument is called the argument form or test form of the argument. The importance of the concept of form to logic was already recognized in ancient times. Aristotle, in the Prior Analytics, was probably the first to employ variable letters to represent valid inferences. Therefore, Łukasiewicz claims that the introduction of variables was 'one of Aristotle's greatest inventions'. According to the followers of Aristotle like Ammonius, only the logical principles stated in schematic terms belong to logic, and not those given in concrete terms. The concrete terms man, mortal, etc., are analogous to the substitution values of the schematic placeholders 'A', 'B', 'C', which were called the 'matter' (Greek hyle, Latin materia) of the argument. To demonstrate the important notion of the form of an argument, substitute letters for similar items throughout the sentences in the original argument. All we have done in the Argument form is to put 'H' for 'human' and 'humans', 'M' for 'mortal', and 'S' for 'Socrates'; what results is the form of the original argument. Moreover, each individual sentence of the Argument form is the sentence form of its respective sentence in the original argument. Attention is given to argument and sentence form, because form is what makes an argument valid or cogent. All logical form arguments are either inductive or deductive. Inductive logical forms include inductive generalization, statistical arguments, causal argument, and arguments from analogy. Common deductive argument forms are hypothetical syllogism, categorical syllogism, argument by definition, argument based on mathematics, argument from definition. The most reliable forms of logic are modus ponens, modus tollens, and chain arguments because if the premises of the argument are true, then the conclusion necessarily follows. Two invalid argument forms are affirming the consequent and denying the antecedent. Therefore, Coco is a dog. Missy is not a cat. Therefore, Missy is not an animal. A logical argument, seen as an ordered set of sentences, has a logical form that derives from the form of its constituent sentences; the logical form of an argument is sometimes called argument form. Some authors only define logical form with respect to whole arguments, as the schemata or inferential structure of the argument. In argumentation theory or informal logic, an argument form is sometimes seen as a broader notion than the logical form. It consists of stripping out all spurious grammatical features from the sentence (such as gender, and passive forms), and replacing all the expressions specific to the subject matter of the argument by schematic variables. Thus, for example, the expression 'all A's are B's' shows the logical form which is common to the sentences 'all men are mortals', 'all cats are carnivores', 'all Greeks are philosophers' and so on. On the traditional view, the form of the sentence consists of (1) a subject (e.g., "man") plus a sign of quantity ("all" or "some" or "no"); (2) the copula, which is of the form "is" or "is not"; (3) a predicate (e.g., "mortal"). Thus: 'all men are mortal'. The logical constants such as "all", "no" and so on, plus sentential connectives such as "and" and "or" were called syncategorematic terms (from the Greek kategorei – to predicate, and syn – together with). This is a fixed scheme, where each judgment has a specific quantity and copula, determining the logical form of the sentence. , involving the logical connectives for universal quantification and implication. The more complex modern view comes with more power. On the modern view, the fundamental form of a simple sentence is given by a recursive schema, like natural language and involving logical connectives, which are joined by juxtaposition to other sentences, which in turn may have logical structure. Medieval logicians recognized the problem of multiple generality, where Aristotelian logic is unable to satisfactorily render such sentences as "Some guys have all the luck", because both quantities "all" and "some" may be relevant in an inference, but the fixed scheme that Aristotle used allows only one to govern the inference. Just as linguists recognize recursive structure in natural languages, it appears that logic needs recursive structure. ^ Hurley, Patrick J. (1988). A concise introduction to logic. Belmont, Calif.: Wadsworth Pub. Co. ISBN 0-534-08928-3. ^ Bassham, Gregory (2012). Critical thinking : a student's introduction (5th ed.). McGraw-Hill. ISBN 978-0-07-803831-0. ^ J. C. Beall (2009). Logic: the Basics. Taylor & Francis. p. 18. ISBN 978-0-415-77498-7. ^ Paul Tomassi (1999). Logic. Routledge. p. 386. ISBN 978-0-415-16696-6. ^ Robert C. Pinto (2001). Argument, inference and dialectic: collected papers on informal logic. Springer. p. 84. ISBN 978-0-7923-7005-5. Richard Mark Sainsbury (2001). Logical forms: an introduction to philosophical logic. Wiley-Blackwell. ISBN 978-0-631-21679-7. Gerhard Preyer, Georg Peter, ed. (2002). Logical form and language. Clarendon Press. ISBN 978-0-19-924555-0. Gila Sher (1991). The bounds of logic: a generalized viewpoint. MIT Press. ISBN 978-0-262-19311-5. Pietroski, Paul. "Logical Form". In Zalta, Edward N. (ed.). Stanford Encyclopedia of Philosophy.